Recycling - Curbside collection The City of Pella contracts for residential curbside recycling. Recycling is collected once per week for residential customers as part of the City’s Solid Waste and Recycling Program. Can & Bottle Redemption Iowa's Beverage Containers Control Law, also known as the "Bottle Bill," helps reduce and clean up litter by recovering beverage containers for recycling. Iowa's bottle bill deposit law covers all carbonated and alcoholic beverages. Consumers pay a five-cent deposit when purchasing a beverage container and receive a five-cent refund when returning the container to a store or redemption center. Before dealers, such as grocery stores and convenience stores, can lawfully stop redeeming cans and bottles, they are required to have a redemption center approved by the DNR so check with your store about redemptions. Yard Waste Program The City of Pella contracts for the collection of residential yard waste. The Yard Waste Program is paid for only by those residents that utilize the program through the purchase of City authorized yard waste bags and brush stickers. Yard waste is collected each Wednesday March-November and the 1st & 3rd Wednesdays December-February. Where can I recycle my electronics? 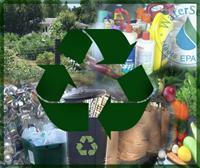 Visit the EPA and IDNR websites for information on recycling or donation programs and providers. The City's local landfill, South Central Iowa Solid Waste Agency (located 10 miles south of Pella), has an electronic recycling program. For more information call 641.828.8545. What should I consider, or look for, when buying electronics? Being environmentally responsible with electronics involves not only proper end-of-life disposition of obsolete equipment, but also purchasing new equipment that has been designed with environmentally preferable attributes. First, look for a vendor that has a take-back program for your old item, then look for electronics that: contain fewer toxic constituents, use recycled materials in the new product, are energy efficient (e.g., showing the Energy Star label), are designed for easy upgrading or disassembly, use minimal packaging and meet performance criteria showing they are environmentally preferable. Leftover household products that contain corrosive, toxic, ignitable, or reactive ingredients are considered to be household hazardous waste (HHW). Products, such as paints, cleaners, oils, batteries, and pesticides that contain potentially hazardous ingredients require special care when you dispose of them. Improper disposal of HHW can include pouring them down the drain, on the ground, into storm sewers, or in some cases putting them out with the trash. The dangers of such disposal methods might not be immediately obvious, but improper disposal of these wastes can pollute the environment and pose a threat to human health. Consider reducing your purchase of products that contain hazardous ingredients. Learn about the use of alternative methods or products—without hazardous ingredients—for some common household needs. Contact South Central Iowa Solid Waste Agency at 641.828.8545 for more information on their Household Hazardous Waste program. Each year the South Central Iowa Solid Waste Agency sponsors free HHW drop off events. This event is held in the spring of each year and has historically been held in Pella. Information on this event can be found in the City Newsletter or on the City’s website a few weeks prior to the event. Visit Energy Efficiency and Rebates on the City of Pella’s Electric Department page for more information energy efficiency. Look for a EPA’s WaterSense label. WaterSense label means products that have been certified to be at least 20 percent more efficient without sacrificing performance. Other Ways to Conserve - these simple fixes can save you thousands of gallons of water a month. Install low flow toilets, shower head and faucets. Check for dripping faucets/shower heads or running toilets and make repairs immediately. Leaking garden hoses, nozzles and broken sprinkler heads should be replaced. In spring of 2012 the Community Services Department was excited to offer a new Community Gardens program. The program is designed to bring gardeners, both amateur and experienced, together in a community-based experienced. The location of the Community Gardens is Kiwanis Park immediately west of the tennis courts. Each participant is required to sign a Guidelines & Plot Rental Agreement which is intended to inform gardeners of the rules that govern the program and to hold gardeners accountable for their plot and its maintenance. Plot rental is $25 per year with $25 deposit also required at the beginning of the season. The size of each plot is 6’ x 20’. Gardeners are responsible to plant, cultivate, and maintain/weed their own plot as well as harvest the produce in a timely manner. Each gardener is responsible for disposing of their garden waste. Watering of the garden plots will be performed by the Parks crew. All the plots for 2013 have been rented! Pella Farmers’ Market showcases items that must be made or grown personally and locally. Pella Farmers’ Market is typically open during the months of May – October on Thursdays from 3-6 pm. June – August the market expands to Saturday mornings, too! The smaller market will run from 9-11 am on Saturdays with peak vegetable production and some great homemade items. The Farmers’ Market is located at First Reformed Church (603 Broadway) one block south of the post office in Pella, IA. Trees provide many benefits in our community. Visit our Tree Page to find out more about selecting trees for your yard and planting tips.